1GB here, 50GB there—the bonus cloud storage space you can pick up by buying a Chromebook, connecting a Samsung tablet or subscribing to Office 365 can soon start to add up. The trouble is, many of these tempting deals are time-limited, which can leave you in quite a pickle when the expiration date passes. Typically, cloud storage services will allow you to keep the files you've already uploaded while preventing you from adding new files until you're back below your limit (check the details of your package for more information). However, knowing when your deals are going to run out makes it much easier to move your data around in preparation (or save up for an upgrade). Dropbox — Log into your account on the Web, click your account name and choose Settings from the drop-down menu. Open up the Account tab, click View all space earned and you can see exactly where your bits and bytes have been accrued. Any offers that have an expiration date will have it listed alongside them. Google Drive — At the foot of your main files list in Drive you should see a small panel showing how much space you're currently using. Click the Manage link to see more details, then hover over the total storage pie chart. A pop-up window will show you where this space has come from, together with any relevant expiration dates. OneDrive — OneDrive deals aren't quite as common as those for Dropbox and Google Drive, but if you have any associated with your account you should be able to view them by clicking the cog icon on the main Web interface and choosing Options. Follow the Get free storage link to earn some space through friend referrals. Box — Now more of a business-oriented service, Box has been known to throw out special offers and is currently running promotions with the likes of LG and HP. 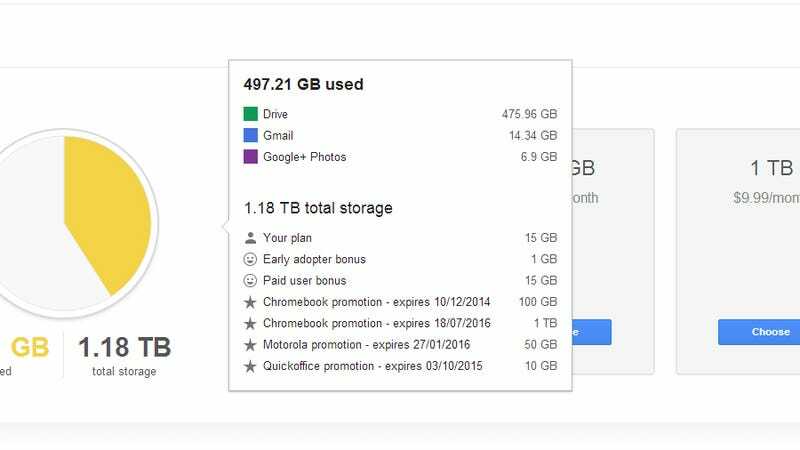 From the front page of your account, click the total storage widget on the right and scroll down the page to see the details about any offers attached to your Box, including their duration.